Loki and the ice gods from the film Thor have come to Earth to take over (If you haven’t seen Thor, there is some background to The Avengers in it which is good, but not totally necessary). Secret government agency Shield is stepping in to deal with it, and assemble their crack team; Iron Man (Robert Downey Jnr), Thor (Chris Hemsworth), Dr Bruce Banner/The Hulk (Mark Ruffalo), Natasha Romanov (Scarlett Johansson), Hawkeye (Jeremy Renner) and Captain America (Chris Evans). All those egos, all those different approaches, and of course, it almost brings the team apart. But, they learn to work together, and that’s what’s important in life. It’s possibly not important to have seen the various films leading up to this one before, although I’m still not sure who Hawkeye is and how he fits into the whole Shield picture. Natasha Romanov had a part in Iron Man 2, and seeing that again after seeing The Avengers gives her character some background, but not too much. The thing I loved the most about this flick was the quick-witted dialogue, and it was not surprised to see Joss Whedon credited as director and co-writer in the closing credits. That and seeing Robert Downey Jnr and Mark Ruffalo onscreen bantering, which was pretty awesome. As with all of these Marvel films, watch to the end of the credits – there’s a teaser for a future adventure. Hopefully, The Avengers 2 – let’s get these guys back together. Oooh, just checked IMDB… The Avengers 2 – 2015! 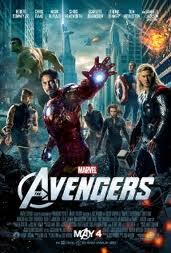 The Avengers was nominated for an Oscar for Visual Effects and a BAFTA for Special Visual Effects.